The Best Language Learning Podcasts from thousands of Language Learning Podcasts on the web using search and social metrics. Subscribe to these audio podcasts because they are actively working to educate, inspire, and empower their readers with frequent updates and high-quality episodes. Language Learning Podcast newsletter is a comprehensive summary of the day's most important audio podcasts episodes from the best podcasters on the web, and delivered to your email inbox each morning. To subscribe, simply provide us with your email address. United Kingdom About Podcast I'm Kerstin from Fluent Language, and together with my co-host Lindsay from Lindsay does Languages, I'm on a mission to help you get excited about language learning. We both learn languages every day in our lives, and we have learnt over 15 different languages between us. In this show, we share stories, news, tips, and ideas that will make you fluent...eventually. Montreal, Canada About Podcast At Culips, we make English understandable. Our mission is to help you learn English the way it's really used by native speakers in everyday conversations. That's why our episodes are always focused on real, current English. If you want to learn English for everyday use, you've come to the right place. Facebook fans 55,598. Twitter followers 4,030. About Podcast Through this podcast get linguistic adventures with Helen Zaltzman. Facebook fans 6,710. Twitter followers 25,976. Tokyo About Podcast Learn Japanese Podcast is a fun website and podcast for studying Japanese with a useful Japan guide section. With over 100 podcasts there is plenty of great content for you to sharpen your Japanese language skills. Facebook fans 2,864. Twitter followers 5,612. Valladolid, Spain About Podcast Learn Spanish easily listening to native speakers. Practice conjugation, pronunciation and improve your ability to understand and speak Spanish along with tips and tricks. Facebook fans 2,668. Twitter followers 1,561. Paris, France About Podcast DailyFrenchPod is a complete solution to learning how to communicate in French. It combines free podcasts and a very effective communicative teaching method that enables users to learn French when and where they wish to. London, UK About Podcast Luke's English Podcast is an audio programme for learners of English. Practise English, Pick up vocabulary & have a laugh. Facebook fans 19,559. Twitter followers 5,041. About Podcast A Cup Of English Podcast is a friendly, everyday English to help the anxious language learner, Texts, grammar notes and much more. About Podcast Daily Easy English Expression is a podcast is for english learners around the world. Osaka, Japan About Podcast AJ Hoge is the founder of Effortless English. He is known as the #1 English teacher in the world and is famous for creating powerful English speakers and international leaders-- without using boring textbooks. Through this podcast he teaches people to speak English easily, quickly, and automatically. Facebook fans 388,283. Twitter followers 82,905. About Podcast Learn Advanced Conversational English with Professional American Teachers Lindsay and Gabby. Facebook fans 46,389. Twitter followers 2,373. About Podcast Business English Pod publishes audio and video of cast lessons and online learning materials for intermediate and advanced business english learners. The lessons cover a comprehensive range of business english skills for meetings, presentations, telephoning, negotiating, job interviews, travel and more. Facebook fans 83,479. Twitter followers n/a. New York About Podcast Happy English tutoring is ideal for language students, homemakers, and business professionals who want to brush-up their English. Facebook fans 464,646. Twitter followers 10,028. About Podcast Kevin Stroud presents the History of English Podcast for word lovers and history buffs. Facebook fans n/a. Twitter followers 4,455. About Podcast English for Professionals Podcast helps international professionals learning English stay up to date with business news around the world and learn business English vocabulary, collocations, phrasal verbs, and idioms in the process. Facebook fans 12. Twitter followers 28. Facebook fans 943. Twitter followers 63. About Podcast Streaming audio recording and transcript/text of the Slow American English podcast for learners of American english. Facebook fans 104. Twitter followers 355. México About Podcast Blania Spanish Podcast is about improving your Listening Skills. Listen News, Tips and Tricks about Spanish. Slow speaking and more. Facebook fans 387. Twitter followers 146. About Podcast Fun Learning Chinese is a podcast which makes chinese learning easy and funny. About Podcast Conlangery is a weekly podcast created by conlangers, for conlangers. Every week, George, William, and our guests talk about a conlanging- or linguistics-related topic or feature a conlang or natlang to discuss in-depth. Facebook fans 515. Twitter followers 884. About Podcast Learn Brazilian Portuguese online with our Podcasts. Tokyo, Japan About Podcast The TEFLology Podcast aims to brighten up your commute to work or evening stroll with some interesting information about current events, history, and methods and approaches in language education. We also bring in-depth interviews with leading figures in the field of English language teaching. Facebook fans 416. Twitter followers 1,818. Melbourne, Victoria About Podcast A show interviewing people who have learnt Chinese from scratch to fluency. Facebook fans 139. Twitter followers 8. Brazil About Podcast Follow English specializes in the teaching of adult learners of english. This podcast is for EFL learners and teachers. Facebook fans 279. Twitter followers 71. About Podcast Extreme Vocabulary is a monthly podcast where we contextualize words in terms of their history, etymology, politics and aesthetics. 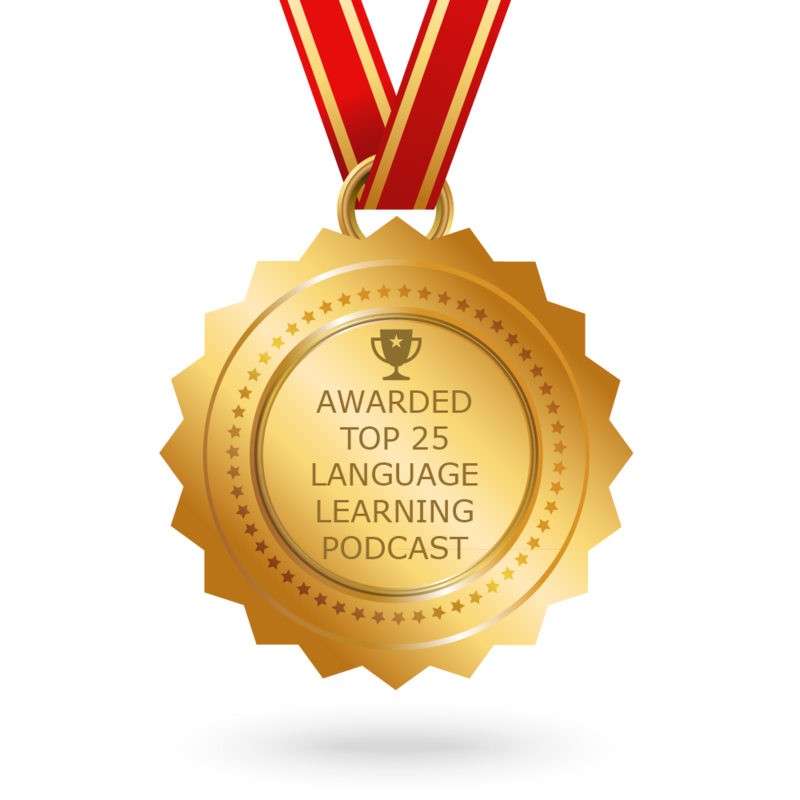 CONGRATULATIONS to every podcast that has made this Top Language Learning Podcasts list! This is the most comprehensive list of best Language Learning Podcasts on the internet and I’m honoured to have you as part of this! I personally give you a high-five and want to thank you for your contribution to this world.